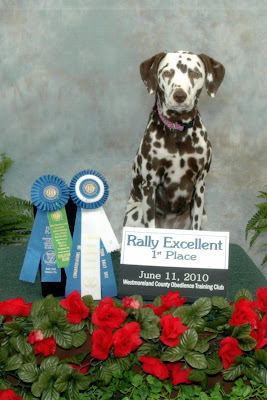 Last evening, I picked up my photos from the Rally trial last week where Jazz earned her Rally Excellent title. This is sort of the "official" photo, very serious. Then I just had to have this one, too, because it was so cute. The photographer was making noises to get Jazz's attention...and this is what she got! This is probably more the true Jazz. It was a very busy week at work and I've got two classes today, teaching folks the fitness ball exercises with their dogs. Maybe tomorrow I'll get around to the video of Jazz's Coaching Certificate test and get that posted. While Jim and Tess were at agility this weekend, Jazz and I traveled to Springfield, OH, to the home of Cindy and Tom Gootee for a Dalmatian Club of America sanctioned Coaching Certificate test. 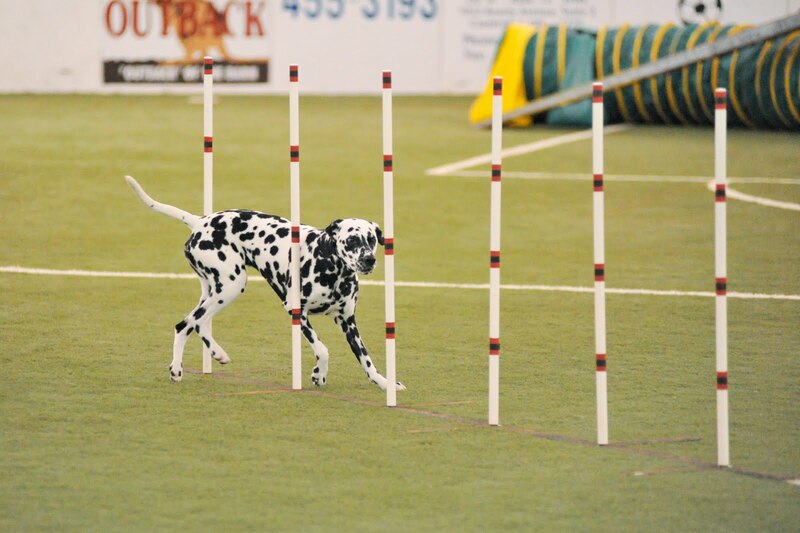 The Coaching Certificate test is sort of a precursor to the Road Trial and evaluates the dog's ability to coach. Each exercise is only about 200 yards in length, so there is no real endurance involved. Jazz and miniature horse Clockwork. Clockwork was used to acquaint the dogs with a horse and later pulled a cart. We met lots of great people and Dals at the Coaching test. Here's the whole group who participated in the test and the fun run. There was also a vet tech available who was taking blood samples from the Dals for the Canine Health Information Center (CHIC) DNA Repository at the University of Missouri-Columbia, so Jazz also became a CHIC DNA donor! Here's me and Jazz after passing the Coaching Certificate test, with our driver Steve and Monte and Rudy, the team of horses who pulled the wagon for the test. Steve is a very skilled driver, and Monte and Rudy were an awesome team, great around the dogs. After the test, we were able to relax and enjoy a picnic with everyone. Jazz and I really enjoyed our trip to Springfield and the opportunity to meet all the folks who brought their Dals out for this event. I have video of Jazz taking the Coaching Certificate test, and as soon as I figure out how to edit and add some descriptions of what you'll be seeing, I'll post it. Right now, though, I have to get caught up on the piles of work that I neglected while Jazz and I were out having fun this weekend! Tess had a great weekend at AKC agility in Washingtonville, OH. Despite the heat and humidity, which Tess does not tolerate well, she qualified in Standard on Friday and had double-Qs on both Saturday and Sunday! Nice job, Jim and Tess! Jazz earned her Rally Excellent title today at the Westmoreland County Obedience Training Club trial!! Not only did Jazz earn her title today, but she did it with a first placement. All three of her Excellent legs were first place runs, so I'm really proud of my little brown girl. She did a nice job even though we once again had a very difficult honor (the dog running the course thought that perhaps he ought to come and check Jazz out), but Jazz held her stay. There was a photographer at the trial who took pictures of Jazz with her title ribbon, so I'll have to share those pics when I get them. In the meantime, thanks to my friend Mellissa for snapping these for me to post. Jazz really seems to enjoy Rally, so we'll probably continue on for our RAE. That requires that the dog and handler qualify in both Excellent and Advanced on the same day and you need 10 legs to earn the RAE title. It's a big investment of time and money, but I really enjoy being out there with Jazz, and I think she likes it, too. I'm also hoping to start Tess in Rally in the fall and eventually want to do Rally Pairs with both Tess and Jazz, so that should be an adventure! Jazz and I continued our Road Trial training last evening by trying coaching with a horse and cart. We met Doris of Wolfe Dream Carriage at Northmoreland Park and had a wonderful ride with her beautiful and gentle horse Bonnie. Here's Jazz coaching alongside the cart on one of the trails in the park. It was a great evening for a ride, nice and cool for both Bonnie and Jazz. Here's Jazz coaching alongside Bonnie. I would have preferred her to be back by the cart more, but I've spent a lot of time teaching her to hock, and that was the position that she preferred. After Jazz got over the novelty of being out with a horse and cart in a lovely park (and ran off some energy), she fell more into a coaching position behind the cart, which is very acceptable. We rode for over an hour, with only a short break to give Jazz some water. Although she was panting during the ride, I was very pleased with how quickly she came back to a baseline after the ride was over. She showed no adverse signs this morning and engaged in her normal play routine with Tess. I think that some of our endurance training is paying off, so we'll continue exercising on the fitness ball, walking, and biking. I was incredibly pleased with Jazz while we were out with Doris and Bonnie. This is the first time she's ever seen a cart and she was off lead in an incredible park with lots of distractions. At one point, Jazz spotted a little critter scamper down an intersecting trail and stayed with the horse and cart. Even the birds, which are her big temptation, didn't faze her. This was a wonderfully positive experience for us both. What a pleasant evening it was to ride along in the cart with Bonnie. She is an amazingly smooth horse and the surroundings in the park made for a very relaxing evening. The fact that I could combine this incredible experience with my dog was a real bonus! After our ride in the park, we went back to Wolfe Dream Carriage to see some of the 20 carriages they have, as well as meet the equine (and canine) family. This is Toy and her 2-week-old baby Razzle Dazzle. If you ever need a carriage for a wedding or event, I'd highly recommend Wolfe Dream Carriage. Doris and Bill are lovely people who take good care of their horses. Their carriages are beautiful and their horses are well behaved, and they were more than accommodating to me and Jazz. I hope to ride with them again soon. We just got in from our club's CPE trial, and Tess and Jazz had what our friend Ron likes to call a "polyester weekend." Tess qualified and placed in 9 of her 10 runs! She missed a perfect weekend by one second, which happened when she had to stop to sneeze just before the weaves in the last class of the trial. Arrrgh!! We're thrilled with her performance, though, since her nine qualifying runs were in either Level 5 or the Championship level, which are the highest levels of competition in CPE. 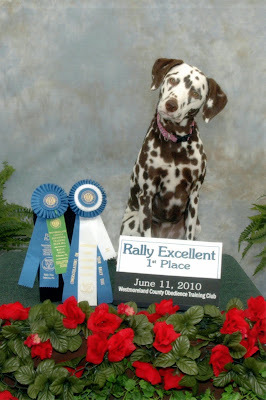 Tess also Q'd in 7 of 8 runs in CPE agility two weeks ago, and had a double Q and two Standard Qs in AKC agility last weekend. Little sister Jazz is starting to get the hang of this agility stuff. After a rather dismal 1 for 8 performance at CPE two weeks ago, she got a Novice Standard Q in AKC last weekend and qualified in 8 out of 10 runs this weekend!! Jazz is really starting to settle in and get comfortable with agility and had a really fun weekend. She is becoming less and less tentative and really showing what she can do. She had a rather tough transition from running with me to running with Jim (as evidenced by that 1 for 8 weekend where she spent most of her time in the ring looking for me), but they really pulled together this weekend and made a great team. I've decided to leave the agility stuff to Jim, while I concentrate on Rally, Obedience, and Jazz's Road Trial training. With me now taking riding lessons and doing the endurance work with Jazz, along with our Rally and Obedience classes, it really left very little time for me to work on agility training, not to mention my full-time court reporting business. I really think that Jazz will benefit in agility from having a confident handler like Jim, and I'd prefer to concentrate on Rally and Obedience, along with our Road Trial work. So, that's our agility update. We have another busy weekend next weekend, and then things will settle down until late July. It's been a lot of fun spending the past few weekends with our agility friends, but not much gets done at home while we're playing...and the work weeks come around again way too quickly! !